Internally displaced people gather water from a natural spring at Elevage camp in Bambari, Central African Republic on Sept. 7, 2018. Around 20,000 people live in this camp, which was set up in response to the most recent crisis in this country in 2013. It’s not bullets and bombs that are the biggest threat to children, a new report says. It’s water. Water is an essential human right, yet more than 2.1 billion people around the world lack regular and safe access to it. The situation is even more dire in war zones. You can join us in taking action on this issue here. Children under 5 years old living in war zones are 20 times more likely to die from waterborne illnesses than from violence, according to a new report by UNICEF. Children under the age of 15, meanwhile, are more than twice as likely to die from waterborne illnesses than violence in areas of conflict. 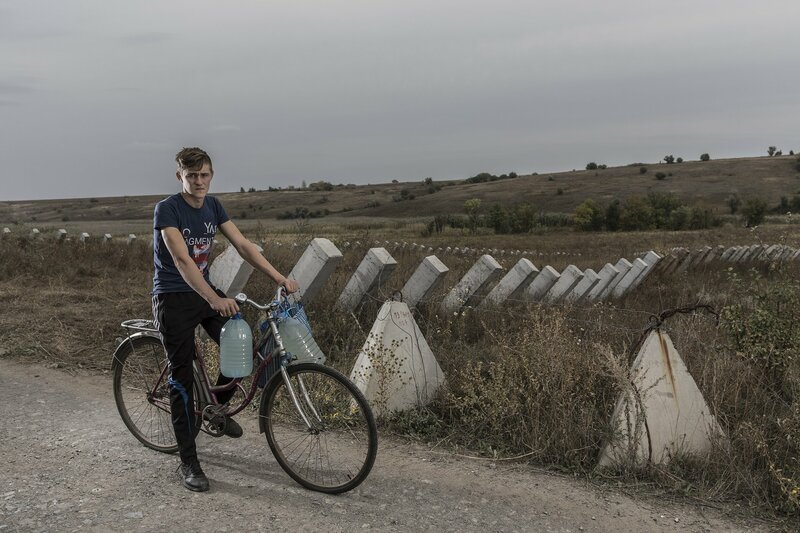 Dima Mikhalyov, 15, is pictured his bicycle carrying water in bottles on his handlebars next to a field of antitank barriers on the outskirts of in Bakhmutka in the Donetsk region of Ukraine, on Sept. 22. 2018. The report looks at conflicts in 16 countries and found that children in all but two countries — Syria and Libya — faced greater risks from contaminated water supplies than from bullets and bombs. Hundreds of millions of children are living in conflict zones around the world, and more countries are engaged in conflict than at any point in the last 30 years, UNICEF notes. “When you think of the dangers that children face when living in countries affected by conflict, you immediately think of bullets, bombs, landmines, but actually the biggest threat to children, and especially young children, is a lack of access to safe water,” Joe English, communications officer at UNICEF, told Global Citizen. “Being forced to rely on unsafe water isn’t only a risk in terms of diseases such typhoid and cholera, it also makes children more vulnerable to malnutrition, which in turn makes them more susceptible to diseases — a vicious circle,” he added. Globally, more than 2.1 billion people lack access to safe drinking water, and millions of people die each year from waterborne illnesses, including more than 525,000 children under the age of 5 who die from diarrheal diseases. Conflict zones are especially susceptible to water problems. As warring parties fire heavy weaponry at each other, critical infrastructure including water pipelines often become collateral damage. As a result, civilians living in cities under siege often have no way of accessing safe drinking water. 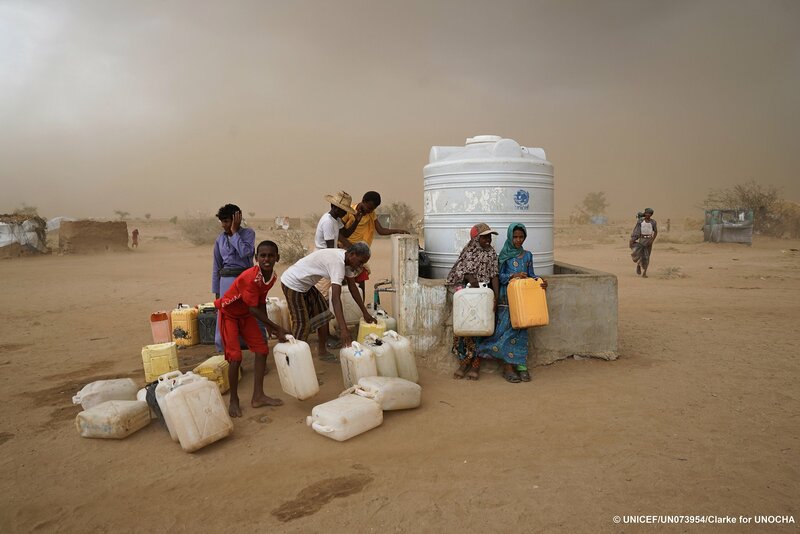 Internally displaced persons (IDPs) collect water as a sandstorm approaches in Abs IDP settlement, Hajjah Governorate, Yemen, May 6, 2017. Water is heavily rationed and only available during one-hour windows three times a day. In Yemen, for example, the ongoing civil war has left 19 million people without reliable access to clean water in what has become one of the greatest humanitarian disasters in the world. Families who are displaced from their homes often end up in ad-hoc refugee camps that lack reliable water and sanitation infrastructure. These camps often experience outbreaks of waterborne illnesses like cholera, which children are more likely to contract. Rohingya refugees in Bangladesh, for example, have been contending with the spread of cholera for the past two years. Polio and typhoid are two other diseases that become more likely among children in conflict zones because of a lack of access to water. In addition to illnesses, children who lack water are more likely to experience malnutrition and are less able to continue their educations. Girls without access to fresh water have a harder time managing their periods, and become more prone to sexual violence. 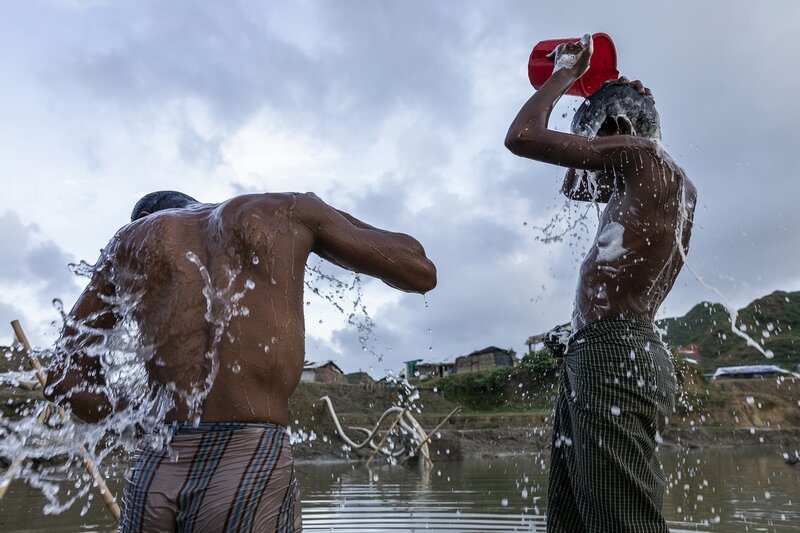 Young men bathe in in Nayapara refugee camp, Cox's Bazar, Bangladesh on July 17, 2018. The report urges countries to, first and foremost, take measures to reduce conflict, and especially to reduce attacks on water and sanitation infrastructure. UNICEF brings attention to 12-year old Bashir who, along with his family, only has two hours of access to water each day in Damascus, Syria, which has been thoroughly destroyed by the country’s civil war. Next, infrastructure to facilitate clean water access should be built and broad networks of people to maintain those systems should be assembled. The report highlights a solar-powered borehole that was built in the Bakassi camp for internally displaced people in Northwest Nigeria, which allows a young girl named Aisa to get regular, fresh water. Finally, these systems have to be protected against deterioration. Far too often, water systems break down in a matter of months or years, and leave people stranded without this vital resource. “It’s vital the we build a WASH sector capable of consistently providing high-quality water and sanitation services in emergencies,” said English. Pierre Nakifi, 3 years old, and his father Prosper, 32, are pictured in Bamba 2 Village, on the outskirts of Bangui, Central African Republic on Sept. 2, 2018.